A few weeks ago we received an amazing letter from a customer that we have worked with several times in the past. Sometimes, just like anyone, we get lost and forget the real reason that we do what we do, but letters like this remind us that our work is more than just a job… This letter opened our eyes to the work we do in people’s homes and what it really means to be a part of a team that does the best work with the best team members. Our purpose is to make a difference in families and homes across the DFW Metroplex. “Jeff: My wife and I have made it through the first week after having a brand new Carrier system installed in our 14-year-old home. All is well; we are getting the hang of the incredibly sophisticated controls that are a part of the Infinity package. Your sales lady did a great job of coaching us to take the time to “learn” the system and to allow the system to “learn” our choices of controlling the temperature in the different parts of our home as we go through the day. The follow-up team will come out in a few days to make adjustments to the baffles and controllers, but I must say, it has been fun to make changes from my iPhone! What I wanted to share with you,Jeff, is an observation of the people who represent you and your firm. Please keep in mind that I am an “old guy” but I pay attention to how businesses conduct themselves and how they impact the community. First, your install team arrived well in advance of the agreed start time last Monday morning. By 7:15, there were 8 men here to de-install, measure and re-install our unit. These men all introduced themselves to my wife and to me. They were well groomed and in uniforms. Each one knew his task and went to it without a lot of coaching. We checked backby the house about 4 PM and they were still going great. They told us to check back about 7 and then they called us at 6:30 to say they were about to wrap-up. They took a lot of time to carefully explain the zone controls (4) and handed us manuals and user guides. By the time they left, after sweeping us and vacuuming as they went out, I had the Infinity app downloaded and saw how the controls were working. We have now been using the system for one week and find it both user-friendly and, importantly, very comfortable. Second, but equally important, Jeff. I noticed that each of the young men were professional and spoke clearly. It dawned on me that each of these young men was working in different levels of expertise. The team leader led by performing his work professionally. Each of the others seemed to take great pride in his work. Let me tell you why I think this is important: these young men made a choice Monday morning of whether to get out of bed early, clean-up and go do a hard day’s work or not. Each of them made a choice of how to represent his employer and his fellow workers by completing his assigned task. Each of them made a choice about “hanging out” that day or working to provide for his family. It reinforced my belief that Americans are still proud to do a great day’s work for fair compensation. Jeff, it also reinforced my belief that there are employers out there who care about the wellbeing of their employees and the families for whom they provide. I want to congratulate you on being such an employer. It is clear that you care for these young men and their families just as it is clear that they hold you in high regard; they did not cut corners to get out of here in a hurry. They took the time to point out things that we would never know to look for like replacement vent covers and the like. It made me proud to know that these young men were choosing to become a part of “The American Dream” instead of wasting their time as too many do today. You folks have been in our home several times now, Jeff. I have met over a dozen of your staff and find each one as impressive as the last. Consistency is a great thing with employees; you should be proud, Jeff. I’m proud of you and your choice to recruit, retain and recognize men and women like those that been guests in our home. God Bless you, sir, and please let the crew know how much we appreciate their best work. We want to thank Eddie and his wife for trusting Reliant Air Conditioning with their home, and hope you will too. Here at Reliant AC, we’ve been taking care of our customers for over 30 years with quality equipment and expert service – all at an affordable price. We pride ourselves in providing quality sales, air conditioning repair, and heating repair service. 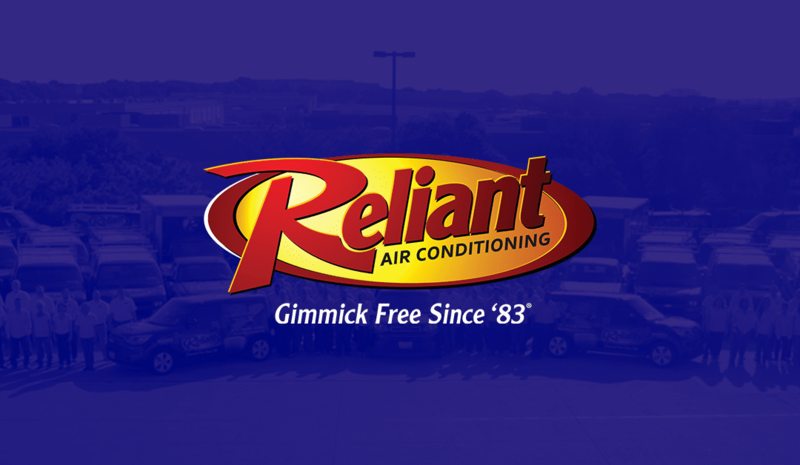 Be sure to ask Reliant Air Conditioning for a free estimate. Whether it’s a new installation or routine service, our factory-trained technicians provide the expertise upon which your comfort depends. Visit our website to learn more about our team or to schedule a free estimate.